When reporting from Enterprise, it’s very important that you set criteria in the correct area for the report you wish to show. One common conflict in this area is confusion between reporting on customers with marketing tags, and reporting on contacts within companies with their own marketing tags. This help sheet aims to run through the differences between the two with the aim of furthering your understanding of how the reporting system works in Enterprise. To run a report based off customers you simply need to go to the Customers area of the system and click on Report/Export. After clicking this button, you will be greeted with the following screen. This is where you specify the criteria for a report. If you wish to add marketing tags as a criteria, click the check box in the upper-right. This will generate a ‘Marketing Tags’ tab to the left of the screen, where you can define which tags you wish to include in the report. Now here’s where it gets a little more complicated. 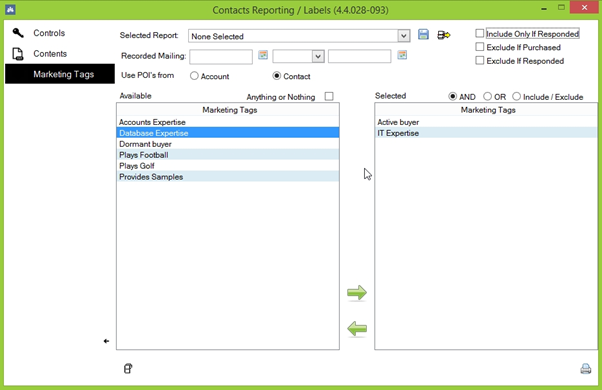 To report on contacts you need to set the initial criteria within Customer reporting to determine which company settings are refined and then proceed to the contact reporting to drill down and refine the contact results. I will show you a specific example with marketing tags against Contacts. You will still have to go into the Customers area of the system and click on report/export once there. In the Customer reporting screen, we set the criteria that relates specifically to the companies we wish to run the report for. Notice the ‘include by marketing tags’ check box is not checked. This is because we do not wish to consider Company-assigned tags, only contact ones. Also note that the ‘include customers’ checkbox is checked. This is because we only want to look at contacts for Customers, not Prospects. If neither Customer nor Prospect is ticked, the system will return a blank as none of our listed companies have been considered, and therefore neither have any contacts. The criteria defined here is actually asking the system to look at ‘ALL customers’ as the range is set from the first company alphabetically to the last company alphabetically. Once you’ve set the company-specific criteria, click on the ‘contacts’ button towards the bottom of the screen to report on the contacts within companies with this criteria. THIS is where you define the contact marketing tags. Check the ‘Include Marketing Tags’ box, then navigate to the ‘marketing tags’ tab to the left and add in any tags you wish to search for. To summarise, to report on customers simply use the customer reporting box. 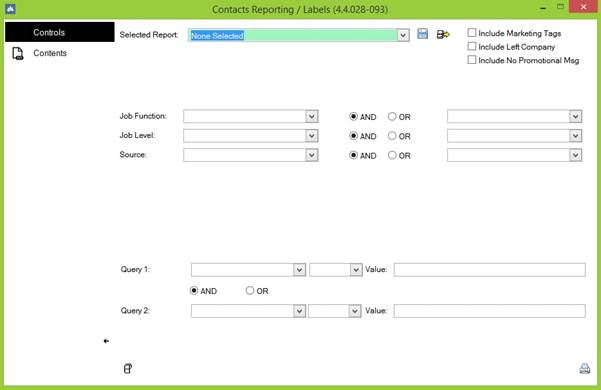 To report on contacts you must navigate through to the contact reporting screen before setting contact-specific criteria. If you set criteria in the customer screen then move to contacts and run the report from there with criteria set in both windows, the report will consider BOTH these criteria. So, say you wish to search for all contacts in a company that have IT expertise. However, when setting up this report, you defined the ‘IT expertise’ tag in the Customers window, before moving on to the contacts window and defining this again, the report will search for ‘Customers who have a marketing tag of ‘IT expertise’ AND Contacts who have a marketing tag of ‘IT expertise’. Basically, the system will only produce results where both the contact AND the company they belong to have an ‘IT expertise’ tag. This would, of course, dramatically reduce our returned results, if we get any at all. Running off the same example scenario, say we want to find all contacts with this marketing tag, but only those belonging to a company in Yorkshire & Humber. This would be a reasonable time to use both windows. 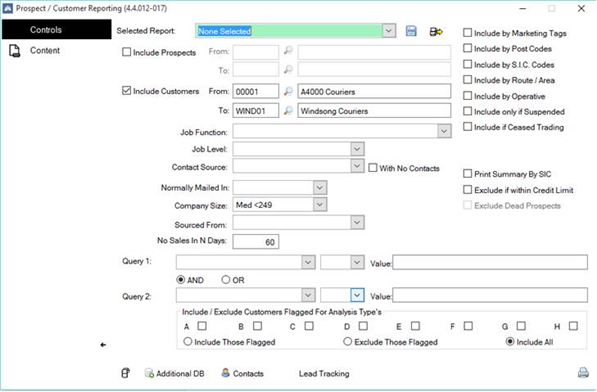 In this instance, you would define a region of Yorkshire & Humber in the Customers reporting window, THEN progress to the ‘Contacts’ window and define the marketing tags. If we defined both criteria in both windows, we would hardly get any results and these would not be representative of the information we were trying to obtain.